The Lowrider 2010 – Locals limited edition collaboration! This maple/fibreglass board provides lots of foot space and a deep concave for good grip and comfy long hill bombs. For maximum stability, it has a dropped platform, which gives you a lowered centre of gravity and more stable and comfortable pushing/foot braking. If you’ve yet not tried a dropped deck, you need to give it a go! The graphics are a collaboration with Locals Apparel. Limited Edition, available in select shops only! This board is available through our dealers as deck only or complete with components from leading manufacturers such as Randal, Paris, Holey and ABEC 11. I wonder if this board is good for sliding cuz i do that alot. i know its more of a downhill board but is it worth the price with a custom setup if i slide but still go pretty fast?? This board is a solid slider at average to higher speeds. The wide platform and deep concave really helps locking your feet in position, this is by no means a downhill board! – More of a flexy carver/commuter in our opinion (but the Lowrider has actually been seen on racing podiums around the world!). where can i buy it? i live in norway. Scroll to the top of this page, then choose Dealers – Norway! I got one today, im in love !!! So, I’ve been reading the comments above but i can’t figure out what kind of board this is. Carving, pusher or downhill? If it’s not a downhill board, why is there a drop in the deck? Anyhow, I’m buying this tomorrow! I know it will be a good bargain! late for work. But I also use it just for the fun of it. I Love the low rider but i’m not sure that its the one i need. Linus! 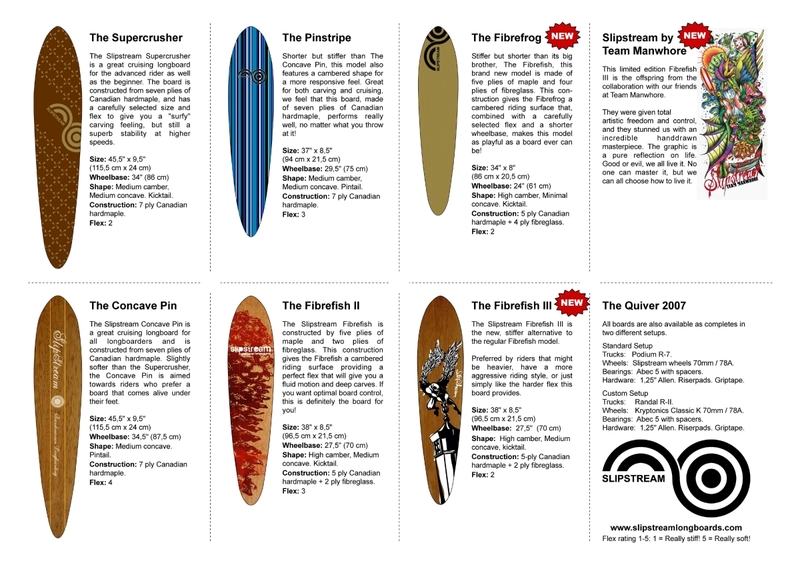 – We do not want to categorize our boards too much for the reason that one board is never the same for different riders! As an example, one board might be a good speedboard for a shorter, lighter rider, but the same board is a good cruisingboard for a bigger, heavier rider! This board is dropped to make it lower, and thus making it easier to push and footbrake with. The lowered centre of gravity also gives you benifits regarding stability. Carlos! – This is a good commuter/pusher and a lot of riders love this board for its effortless pushing abilities and wide, stable platform but yet a fair amount of flex and liveliness. It suits your weight good if you do not mind some flex, and as long as you are not into a lot of technical tricks it sounds to me that this will be a good choice! i’ve been longboarding for 2 years now and want to learn how to slide. i got the low rider 2009 and wonder if its a good board for me when im sliding. im 54kg. Pretty much all boards and wheels are “good” for sliding, but when learning, it is easier on a shorter board with smaller, harder and narrower wheels (like a “normal” skateboard). so kinda like the pinstripe? And try to make an underdstandable answer, because I know almost nothing about longboarding! And is it easy to manouver, due the fact that it’s so low. The difference between the two boards is that “The Lowrider” is topmounted with a dropped platform, and “The Twin” is dropmounted without a dropped platform. Take a look at the pictures here and here to tell the differences! Both these boards are really easy to ride for beginners since they are stable, low and have a wide platform. A smaller board with a shorter wheelbase will be easier to turn with, if that is what you are hinting at, but our best bet is to visit one of our dealers and find out for yourself! But what does a topmounted board do exactly? On a topmounted board the trucks are attached to the deck like trucks have always been mounted on skateboard decks, it does not “do” anything besides attaching the trucks to the deck. hi slipstream, i was just wondering what the differences is between “the lowrider” and “the twin”? Look a few inches above this text and you will find the answer to your question! My friend said he didn’t liked the board because it’s so low that it can sometimes scratch the ground. I’ve just ordered it and i’m really worried about this. This is called “railbite” and is a pretty unpleasant experience for some riders. If you get railbite (or fear getting railbite) on this model, there are three ways of tuning your setup to avoid this. 1. Place a riserpad of prefered size between the truck and the board. 3. A combination of the two above. When set up with 70 mm wheels and a thin riserpad, you get a nice, low ride. But some riders like to have more clearance to the ground and consequently make the adjustments they see fit from the list above. Do not worry, this is really easy to fine-tune after your own preferences. Good luck with the new board! I thought about buying this board and drop it through for a reeeaaally low commuter. But would i weaken the board too much? We have actually done this with a couple of Lowriders. It works out really well and gives you a super-low ride! Beginners love this board for its stability and low profile. Solid choice for carving and cruising! What’s the maximum wheel size you would recommend for this board? We have ridden this board with wheels up to 97 mm, and that has worked out fine! Depending on what type of riding you prefer we usually recommend wheels from 70 to 76 mm though. This is a very good starting-board! I recommend this board, i really do! Good job with this board and thanks. Why is The Lowrider more a downhillboard than the The Twin? Looks like they have almost the same height on the deck, and the same flex. We do not consider either The Lowrider or The Twin downhillboards, but between those two boards, The Twin handles speed better in our opinion. 1. does slipstreams boards break easily?? 2. what to choose the twin or lowrider?? 3. is lowrider/the twin good for cruising and carving?? 1. It is hard to break a Slipstream board, but if you put your mind to it you could probably do it since they are made out of wood. 2. Beginners usually prefer The Lowrider. 3. Both boards are excellent choices for carving and cruising. just wondering – is there like a weight limit for the 2010 lowrider? Been riding a pretty flexy 44″ pintail for some years, no probs there. Guess I just wouldn’t want the board to sag too much is all. I’m one of the heavier riders. Thanks in advance for the heads-up! We have no weight limit for The Lowrider, but it is a board that flexes. A lot of 100kg+ riders are riding and loving this board, but I guess it all boils down to what you prefer! If possible – Try it before you buy it! 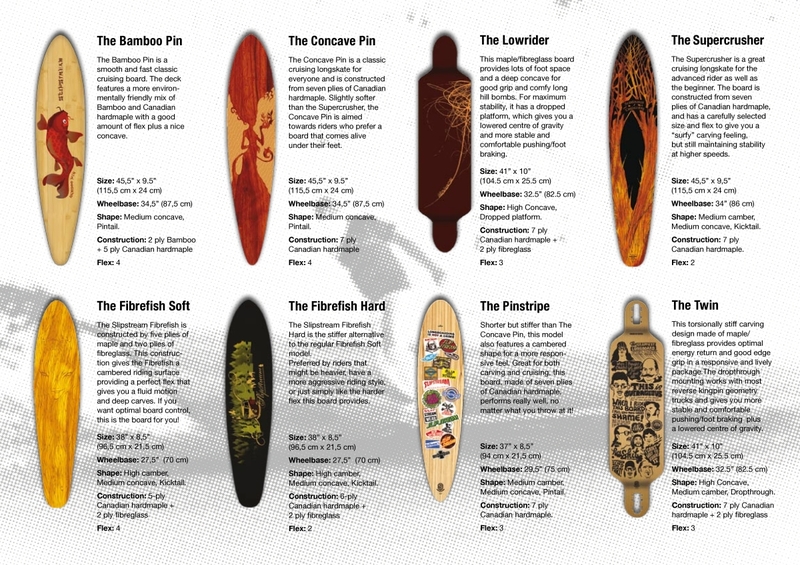 I’m not sure which board to buy, “The Lowrider” or “The Twin” or even some of your other boards. I’m 185cm and 63 kg. which one wil flex the most, and will it flex at all? I want to carve and cruise, and i like the feeling of flex, but at the same time i think it’s nice when the board is close to the ground like the two. i’ve tried my friends’ loaded dervish flex 2 and i thought that was nice. if you would compare the boards to that one, it will help me allot. Both boards will flex, and “The Lowrider” will flex more compared to “The Twin”. We try really hard not to talk about other brands, but “The Twin” will be the closest to the board that you mention. Wider, longer, heavier and with a somewhat firmer flex in our opinion. That really depends on what you compare it to. It flexes more than “The Twin” but less than “The Concave Pin” in our opinion. Did a quick Google Video search and found a few videos, but no real flex tests. Thank you for the suggestion though, we will consider it for future updates! Hi im new at this longboarding thing and i wonder if this is a good longboard then? I want to be able to go down small hills and do some easy tricks. Please reply would be much appreciated! My weight is about 60 kg if that matter, i dont know. This is actually the board beginners like the most when we do demos. Great for small hills, but regarding tricks (depending on what tricks) there are probably better options. Hi! i’m a guy from Sweden and i wonder if the lowrider would be a good longbord for me. I’m a ”noobie” on longbording and i’m 180cm and I weigh about 87-90kg. This board is actually a great board for beginners as well. The lowered centre of gravity and the wide body helps a lot and your weight/length is not an issue. my board got run over by a car this week so I’ve been looking for a nice replacement. 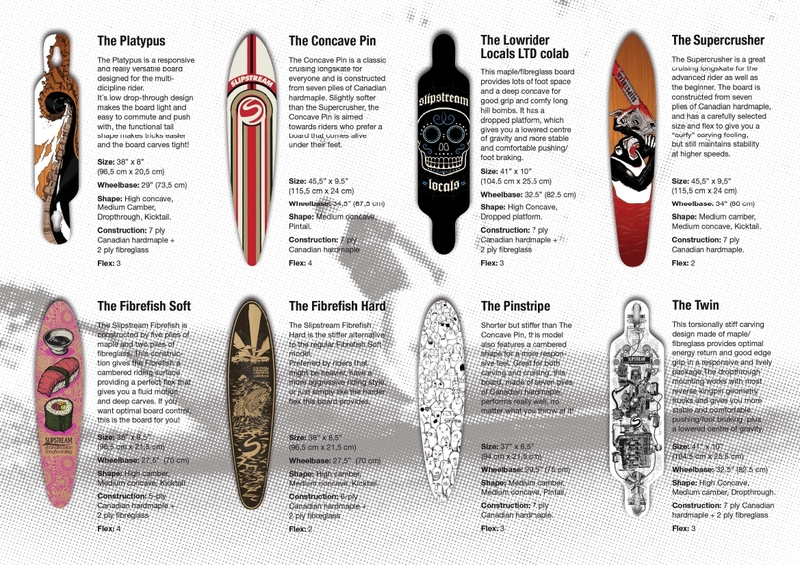 I’m really interested in the lowrider but I would like to do my own graphics as I did with all my previous boards. Is it possible to get the deck blank, no graphics and griptape? Unfortunately, we have graphics on all our decks, but it is possible to remove both graphics and griptape and we have seen quite a few beautifully customized Slipstream boards through the years. I was wondering if this board is good for bombing or downhill?? if not, what slipstream longboard would you recomend for bombing or downhill racing? We will be releasing a latemodel in May called “The DFA” that is aimed a lille bit more towards speed/freeride. You should check that one out for sure! Both are solid choices for you, for 2011 The Twin is shortened and a little stiffer though. If you get the chance to try any or both of the boards before deciding that is always the best solutions as different riders prefer different boards. Good Luck! Kan man fortfarande köpa alla longboards från 2010 ? Hi! I’m a 16 years old girl, I’m 168 cm tall and my weight is 56 kg is this board good for me? I’m a beginner and I’m also kind of into The Twin, Fibrefish Soft and Concave Pin. I’ve heard it’s better with a lower board, but I still want it to be soft… I’ve been trying out my friend’s longboard, it’s a Pinstripe and I love it (especially the flexibility in it), but I’m not sure it’s the best board for me. I’m very grateful for an answer! It is always best to try a board before you buy it, so if you like The Pinstripe that is truly a safe bet! The Lowrider and The Twin are really popular boards, bigger and lower compared to the Pinstripe. The Lowrider flexes a bit more compared to The Twin, but both boards would work good for you as well.